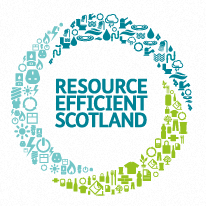 On Tuesday morning, bright and early, we attended the Resource Efficient Scotland workshop in Hampden Park. The workshop focussed on waste prevention and how to reduce costs within your business. The workshop also outlined the Zero waste Scotland regulations which have been in place since January 1st 2014. As an environmentally conscious business, we are already compliant with the regulations and we were pleased to find that we have already implemented many of the waste prevention suggestions that were described in the workshop. We are already segregating our waste streams into plastic, paper, tin and glass. At present, we do not produce over 50KG of food, so we will not have to begin separating food waste until the new regulations kick start in 2016. The main focus of the workshop was on waste PREVENTION. In our effort to reach zero waste production we have already created our own posters and branded waste bins, with each office receiving one mixed recycling bin in place of several waste paper bins. The theory behind removing generic bins and swapping them for recycling bins is that this will encourage people to think about what they are throwing away, and in turn, think about how much waste they produce. Each office also received a poster detailing how to recycle properly, and listing some hints and tips on how to be more energy efficient. Preventing waste from occurring in the building is a difficult task, as many things nowadays are not built to last, IT equipment goes out of date quickly and items tend to come in lots of packaging. The facilitators urged the audience to think about repurposing or repairing items before throwing them away and replacing them. This is something that we would like to encourage our building users to do - or if your items can’t be repurposed and are still in working order, donate them to charity so that they do not end up in landfill sites. Think about where your waste stream occurs and investigate how you can manage this, and monitor how well you are doing with reducing your waste production. Since returning from the workshop we are considering writing a ‘new start’ pack for our tenants to inform each new person that starts in the building of our process. Watch this space for more information!